The Military shadow box, American made military shadow boxes is one of our most versatile awards display cases for long serving veterans and career service men and women, It is the perfect case in which to display the decorations and awards earned through many years of dedication to the mission of protecting our nation and devotion to honor and duty. 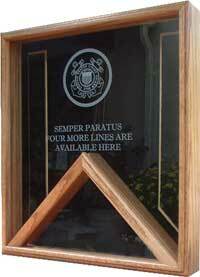 All of our Awards Display Cases are constructed of either Solid Wood. Raised mounting surfaces are available and may be selected for each of these award cases. 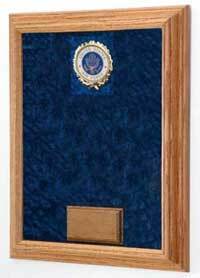 The Military shadow box, American made military shadow boxes accept up to 10 full size medals. Without the raised surfaces you have additional freedom to do your own free style layout. In either case, all of the medals, ribbons, rank pins, crests, patches and special photo(s) will rest on luxurious Crushed Velvet. 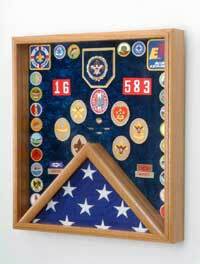 This display case is available in Velvet Colors appropriate for all branches of service, law enforcement agencies, firefighters, EMS personnel, athletes, and fraternal orders. 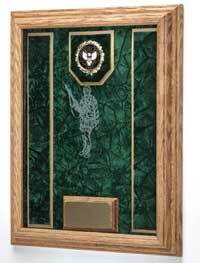 you can Personalize your Military shadow boxaward shadow box inside with a laser engraved metal plate. Choose the plate with Rank, Name, Service Dates, etc. You may also choose our laser engraving on the glass front with a unit logo, map, or other image to commemorate and honor the service of the person for whom the case is intended. When completed, your display case will be totally unique. 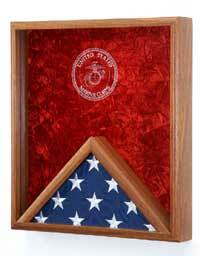 The Military shadow box, American made military shadow boxes will provide a true testament to your service, or that of a comrade in arms, a friend, or loved one. 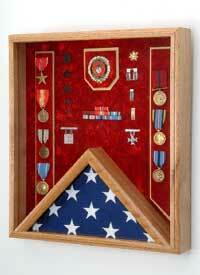 Orders for the Military shadow box, American made military shadow boxes are usually shipped out within one business day to places within the USA and Canada.